Alcohol is a substance that is accessible by all adults in the United States over the age of 21. It is a popular beverage that is on menus at restaurants, available at sporting events and concerts, and is even regularly present in the home environment. Because it is so easily obtained, it is also one of the substances that is abused most often by teens. The teen and college years are the most common and dangerous years for teens to become addicted to alcohol. Teens may first be exposed to alcohol in high school, even though it is illegal for those under 21. Teen alcoholism rehab is available for those teens who have been exposed to alcohol and become addicted. Teens have access to alcohol from a variety of sources, including the home. If you keep wines, wine coolers, beer or other alcoholic drinks in the home, your teen can easily have access to the beverages. As a parent, it’s important to establish boundaries and to make sure this alcohol is not being taken and abused by your teen. Social groups and influences at school may cause peer pressure that will influence your child’s desire to drink. At some point, your teen may have a drink at a party or event. One drink won’t necessarily cause any harm, but it’s important to guard against repetitive drinking that could lead to addiction. An alcohol dependency is dangerous. 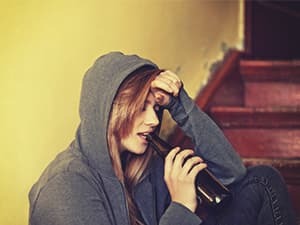 The desire to drink and the withdrawal period that can result from not drinking may cause your teen to have more and more alcohol, which can cause drunken behavior and poor choices to be made. Alcohol combined with driving can be particularly dangerous for teens, and many teens have been seriously injured or killed from drunk driving car accidents. Teen alcoholism rehab focuses on a number of things. First, your teen will go through a period of detoxification. During this time, medications may be used to help your child stop drinking. Some medications will aid this by causing unwanted side effects when alcohol is ingested. Other times, detoxification will simply involve reducing the alcohol in the body until the teen no longer shows signs of withdrawal. The best situation to be in as a parent is the one that doesn’t involve an alcoholic child. Making sure to educate your child about the dangers of alcohol, as well as when it is appropriate, is one way to do this. Gain your teen’s trust with unbiased information about alcohol and what you expect of him or her. If you suspect your teen may have started drinking, contact us for help. Call 1-888-287-0471	Who Answers? to learn more about treatment facilities and what you can do to help your teen. Alcohol abuse is a serious addiction. Like many other addictions, it can be difficult for a teen to stop drinking on his or her own. There have been some studies that suggest ways to prevent your teen from drinking heavily. Consider employing some of these methods to discourage your teen from drinking. Teenager alcoholism rehab treatment programs can successfully help teens who have become addicted to alcohol. Treatment starts with detoxification, which helps your teen by removing the substance from his or her body. During detoxification, doctors will help your child by helping reduce withdrawal symptoms that can make drinking seem impossible to avoid. After detoxification, these clinics offer a number of options for your teen. These include inpatient facilities and outpatient services. An addiction to alcohol can vary in severity, so the treatment your teen needs can vary as well. Some teens do better in inpatient groups, while others may want to complete outpatient treatment. Inpatient treatment allows your teen to live with others who face the same addiction. Lodging is provided, as well as meals and medical care. Your teen will participate in therapy, which might include group therapy, private therapy, behavior therapy, alcohol education and more. Outpatient facilities offer more flexibility than inpatient centers. Outpatient treatment allows patients to come and go. These programs may have your child come in for medications, counseling, education, 12-step program meetings and more. Normally, a medical checkup and alcohol tests will be completed as well to make sure your child stays free from alcohol throughout treatment.